"If we want good leaders…if we want people in power to be influential people who do good, how do we teach people to do that well? How do those people develop, how do we develop them?" 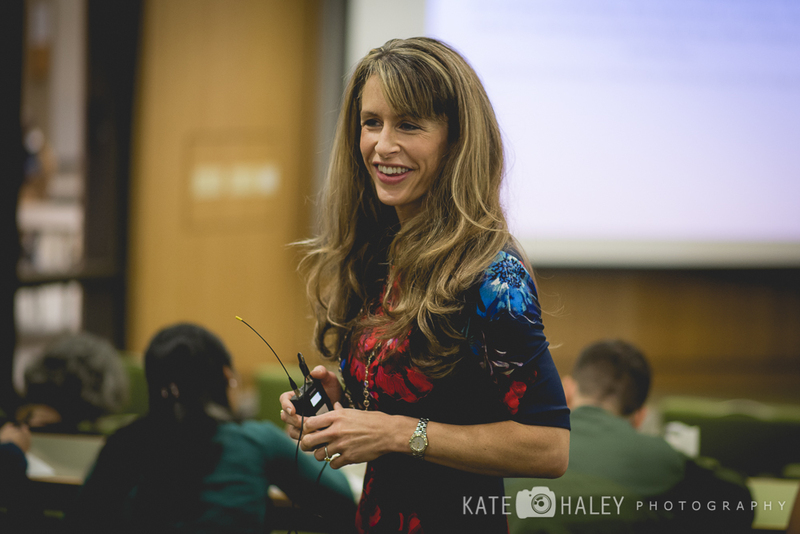 Danielle Harlan is the Founder and CEO of the Center for Advancing Leadership and Human Potential and author of The New Alpha: Join the Rising Movement of Influencers and Changemakers Who Are Redefining Leadership. She earned her doctorate in political science and M.A. in education from Stanford University, where she was a Jacob K. Javits National Fellow and received a Centennial Teaching Award for excellence in instruction. Named one of Silicon Valley’s “40 Under 40,” Danielle has also been a speaker for TEDx and began her career as a special education teacher with Teach for America. Danielle was interviewed as part of our #EdLeader series by RE-ENVISIONED Co-Founder & Executive Director, Erin Raab. The first question is just to tell me a little about you and your journey in the world of education and human development. I grew up in Big Sur California, which is a small town on the central coast of California, and it was the seat of the human potential movement. It was huge there in the 60s and 70s when it was less mainstream and very “woo-woo” to many people. It made me think from a very young age about what it means to live a good life and what our, and my, responsibilities are to other human beings, Thinking about these questions was ingrained in me from a very young age and I think that community very much is still about asking those questions. When I was in middle school we moved to the east coast. I became the first person in my family to graduate from college, which was a really cool thing and having that experience made me recognize the privilege that comes with higher education. My life is forever changed in ways that it would be very hard to undo because of the benefits that I got from college and the social privilege that comes with that. So I was really cognizant of that privilege, particularly when I looked at my siblings, who'd had very different experiences in school, and I wanted to find a way to give back because of the privilege that I'd received. So I became a teacher. I taught for a couple of years with Teach For America and then I actually went on to work for their national office. I was interested in seeing how an organization like Teach For America runs because there are an incredible number of high quality people there doing great work and it's a high functioning organization. There's some debate in education circles as to whether TFA is good or bad (obviously I think it's clear that I lean on the side that they do a lot of good); regardless, it's a really interesting organization to look at in terms of like how they function and how they do the work that they do and how they get such great people on board. "Working for TFA was a really positive experience and it made me think a lot about the importance of teaching in terms of having an impact in the world, and also about what high functioning organizations look like." I went on to Stanford to do a Ph.D. in Political Science. I wanted to study the role power plays in our society: who has power and why? I've seen really great people who have power and influence and I’ve seen really terrible people: I think everyone can think of examples like that. I did a Master's in Education along the way, because I always had this angle and experience of teaching. If we want good leaders…if we want people in power to be influential people who do good, how do we teach people to do that well? How do those people develop, how do we develop them? Then I went on to work for the Carnegie Foundation and, again, I was focused on education but I met a lot of incredible leaders who were doing great work around the world, Certainly at the school level but also at the institutional level and the organizational level. I kept thinking, who are these folks and what can I learn from them? I started taking note of these people, and taking them out for coffee or lunch and getting a sense of who they were and how they did what they did, How were they as effective as they were? I started to see a lot of patterns over time and across people, Some of them were things that you learn in business school, like: Can you set a vision? What are the strategies for bringing that vision to life? How do you recruit good people? How do you act with emotional intelligence? How do you take care of yourself when you're living a high stress life? How do you make sure to get enough sleep? What are the psychological aspects of being an effective leader and an effective human being?" It was interesting because not only did I see patterns across people but it really meshed with what we know from the social science and life science literature research about what it means to live well and how to do it. Eventually people started coming to me for advice on that kind of thing and a friend of mine told me, "You need to start writing down this advice." And I thought, “Yeah, maybe it makes sense to capture all of this somewhere”, So I left the Carnegie Foundation to write The New Alpha book, and in doing that people started asking me to teach and consult and that's how The Center for Advancing Leadership and Human Potential came to be. Sorry…so that was a really long-winded answer! "I had no idea this is what I'd be doing with my life, but I think I made decisions that along the way that really aligned with what I was interested in – with what made me like feel curious and alive and passionate, and also that meshed with my values." In that way, it really makes really good sense, but I don't think it was predictable from the starting point. For sure, that's a good way of explaining it. The next few questions are all centered around one kid that you care about, and preferably this child is still in school. When you're ready, tell me a little bit about that child. Well, the person I'm thinking about was actually a former student, but he was five when I had him, so he's in high school now. He's near the end of school now - does that count? Yes, yes. Tell me about him, who he was at five, and who he is now. He is a student I think about a lot, His name is Eric and he was a student of mine when I taught Special Education in kindergarten. He came into my class and had pretty much every single diagnosis a kid in Special Ed kindergarten can have. And he just was just such a curious happy kid. I mean I know that sounds like a strange and kind of basic reflection, but he really was just a special human being. He was kind and had a desire to really learn. So the interesting part about Eric was we went through the year and he actually finished above grade level for kindergarten. And despite the fact that he had all these diagnoses we ended up exiting him from Special Ed because he was so high performing. Eric gives me hope that someone can come in on paper with a lot of problems or challenges or things they're struggling with, and that it's possible for them to succeed. "I think it's possible to get through to anyone. Our role as teachers is to really figure out how we get through to this human being and how can we make the learning accessible in a way that makes sense to them…where they can really be the best version of themselves." I remember him so well because he was just a delightful human being, but also because he just gave me faith that that is true—that ideal we have that it's possible to get through to any child is something that’s real: it just means we have to work really, really, hard. I hope Eric is able to build a life around whatever it is that gives him a sense of meaning in his life: I hope he's able to effect change in the way only he can with his unique combination of skills and personality traits. When you think about him in his 30s, done with whatever school path he takes - what's a good life, what's a successful life? That might just mean, "I want to have a job that brings me joy, I want to be able to afford a house and to be able to take care of my children if I choose to have children." I mean it can be really basic things; it doesn't have to be, "Oh I'm going to win the Nobel Peace Prize" or whatever, although for some it might be that. "Fundamentally fulfillment is about finding meaning and purpose." So I hope that Eric as he reaches 30s, 40s, and, you know, 90s, whatever, I hope he's able to have the opportunity in life to think about what gives him a feeling of meaning and purpose, and to be able to do that work. And the third piece that I write about in the book is impact. That relates to the other two: do I know my meaning and purpose and am I able to achieve things that align with that, so as to have the impact that only I can have in the world? So I hope Eric is able to build a life around whatever it is that gives him a sense of meaning in his life: I hope he's able to effect change in the way only he can with his unique combination of skills and personality traits. And again, I mean impact in a really broad way, Maybe Eric will go on to run for public office, or maybe it's just that Eric will go on to be a great store manager in whatever kind of store that he would like to work in and he'll be the kind of team leader that people enjoy working with him, they like coming to work. He's fair and honest and ethical and emotionally intelligent…there’s a broad spectrum of what impact can look like, but I hope he feels he's able to do that. Yeah. You expressed that really beautifully; I can tell you speak and think about these things often. Is there anything you worry about getting in the way of him achieving that good life? I think it's really hard. It's very hard to live a life that gives you not just the fulfillment piece but also the achievement and impact. It's hard even if you have access to all of the resources to do that - like I said, I've lived in many ways a very privileged life and I find it hard to do that. And Eric lives in a low-income community, where there weren't the highest performing schools and he didn't have access to the same resources that people with his ability level that live in other communities might have access to. And so there are huge instructional and institutional barriers. I'm sure we all have our own personal barriers, but I think in his case if he just had access he'd be able to have all of those things, but I worry that he won't have access, so I don't know what will happen to him, It makes me sad to think about because when I knew him as a kindergartner he was just one of the most high potential human beings I've ever encountered. I've seen the things that he's able to do, So my hope is that somehow he was able to survive these institutional barriers, but I don't know if that will happen for him. "I have every confidence that individual people in the system care deeply about these issues. But, if you are an individual in the kind of system that doesn't actually care about the outcomes of students, it's very hard to actually change the outcomes unless you're able to change the system." In your ideal world, what would the role of schooling be in helping Eric create the life you're talking about? One of the things we can do in education is to think about not just how to teach students the basic foundational literacies - like literacy in reading, mathematical literacy right, scientific literacy - but also what kind of competencies they need as human beings to be successful. These are the kinds of skills you need not just to lead others but to be a leader of your life, to set the vision for your life and achieve that. We know from psychology these include things like mindset, but also things like persistence and courage and emotional intelligence. Sometimes in education we focus too much on the foundational literacies; and I get that because kids are struggling with that, but if we build in some of these other competencies of what it means to just be a good human being and to be effective as a human being, we'd actually then enable kids to do better at the foundational literacies. So I wish that we would think a bit more broadly as educators in terms of what our role is to our children. And the last thing I'll just say is that teachers and educators are hugely important—I speak to lots of groups of teachers and educators, not just here in the U.S. but around the world—But parents matter a lot too, and as educators we should think about how much time we spend with our students, versus how much time do they spend with their parents and/or family, How can we incorporate them into this work too? So it's not just like six to eight hours a day we're plugging in as much as we can, but rather so that we have a partner in this work - particularly in situations where an educator is only going to have a year with this student in most cases – we’re not going to be as effective as a parent or guardian or family member who potentially has many years with that child. Do you think in Eric's case that schools will play this ideal role that you want them to for him, and in what ways yes and no? An interesting question. I worked in the school district in which Eric is a student and certainly there's a potential that he'll interact with educators that are able to fulfill that ideal. But I don't think the entire system is set up to provide him with it, In many ways they system isn't even setup to provide him with the foundational literacies and I don't think it's in any way set up to provide him with much more beyond that. So, it's quite possible he'll interact with some individuals who do that but, no, on the whole I don't think he'll be exposed to that, and I think it's a problem, He as a human being has great potential and I'm not sure whether he'll live up to it because the system is stacked against him in many ways. "So he can do everything he can but he's existing in a world that is designed to not only NOT produce those outcomes, but in many ways to produce totally different outcomes that aren't going to be as productive for him." Can you say more about that a little bit? Yeah. So two things, One is that, at a basic level, the U.S. school system, particularly some of the under-resourced school districts in the country, are set up, at least in theory, to provide the foundational literacies (and there’s a question of whether they’re actually designed in a way that will enable these). But beyond that I don't think there's a goal to look at these other 21st century skills - the collaboration, creativity, and then the personal leadership skills. And there is institutional racism throughout the system, There's a bias or “isms” against, people who come from much less resourced backgrounds. I'm not sure the people running the system care that those problems exist, or that they're taking action necessarily to remedy them. Which I hope that we're able to do, but I don't see that necessarily happening right now. I think there are individuals who are trying to make a difference, but if you exist in a system that's fundamentally biased and in some ways racist (though it's not just about race, but about socioeconomics morebroadly….) - but if you exist in a system that's setup unfairly to start with, even if you're a very well meaning educator or educational leader, your locus of control is limited. Do you think generally people agree with you on what a good life is? I don't think most people have the luxury of thinking too hard on that question too often. I consider the very fact that I've thought about that question a lot, and I'm able to articulate an answer, to be a very privileged position to be sitting in. So, no, I don't think most people in, let's say The United States where I live, or in the world, necessarily have thought about that or would agree with it just because I don't think they have the time. People are busy and have jobs and family demands that take up their time. Do you think that people agree with you on what the ideal role of school is in creating that life? If I were to speak to a group of parents, in general, if I said, "Do you want your kid to have a life where they are able to achieve what they want to achieve?" I find it hard to imagine a parent saying anything but yes, And, in general, if I talk to educators they'd say that too, Like everything, the devil is in the details, So if you agree with that, are you willing to do what is necessary to make that happen in the school system? That's where I would think there would be like some division. Because we have different ideas of how we operationalize that best, right? On a high level, I think people would generally agree with the ideas that I'm talking about, but in terms of how we make them happen, I don't think there would necessarily be agreement, There would be lots of smart ideas that are very different and I think it's very hard to know which of those will work. Why do you think we have schools as a society - what's the purpose of school? Do you mean historically, how did they get started, or what purpose should they serve? Is it a normative or an empirical question? Do you see them as different? Like what would your answers be for each of them? "I think schools should exist to enable and empower people to grow into the best version of themselves, and also into good citizens." There’s an individual benefit and a social benefit. What do you see as the individual and social benefits? For an individual, I hope schooling inspires curiosity and helps people uncover their interest and passions and what they care about in the world and gives them the tools to really explore those things. Also, it should encourage them to develop beyond just their personal focus, to gain a general understanding of how things work across a variety of fields. I think you and I are both really interdisciplinary people, so maybe you can relate to this. I have my particular interest in my work but if I didn't understand a variety of other fields - like if I didn't understand math, I wouldn't be able to look at a lot of the studies that have very complex mathematical models and make sense of them, So I do think having that well-rounded, generalist, knowledge is important. Then, I hope we inspire curiosity and passion across a particular subject or area for people. This relates to them being able to find meaning and purpose in their work - being able to have the motivation to be high achieving and to have the impact that only they can have in the world. In terms of the social benefits, I hope we help people going through the school system to understand their role in society as people who vote and make political decisions, It could be something more major, like run for office, or just to write letters, or protest. "I hope we give people a sense of why participating in our democracy is important and build some motivation to participate. And I hope we also learn to be supportive human beings to one another." So I'll give you an example. Sometimes I'll be out and I'll see someone open the door for someone else. For instance, they're going in the store and there's maybe someone who's struggling physically to walk and I see someone else open the door - my spouse does this all the time, he's very considerate of people. We were walking the other day and someone was struggling to walk and he asked, "Can I help you; can I get some of your bags for you?" Somewhere along the way he learned to do that, and I hope our schools can play a role in that. I think there are aspects of who we are as human beings that affect how we interact with other human beings, and I hope we think about what our responsibilities are there so that other people can also live a good life and so we're taking care of the earth. I love it; It’s very aligned with how I have come to think about these questions. Can you tell me about an empowering learning experience that you've had? It could be in school or out of school. One the most profound learning experiences I've ever had, and I talk about this a little about in my TEDx talk, was when I was a teacher in school. I had this math curriculum that I was using with my students - this was actually when I was Eric's teacher - and it was just not a great math curriculum. It was one of those based on the philosophy of the day around what works for teaching kids math and most schools don’t use it anymore because it wasn't very good. So my students were really struggling to learn what they needed to learn through this curriculum and I was starting to feel like, “okay this isn't enough”. So I went to my principal and I said, "Hey this isn't really working I can think we need to try something else. Or maybe I need a person to come in and help me to adapt it so that we can make it usable in a way that helps the students achieve their goals." She listened to me. It was a very prescribed curriculum and the school district was very strict about that kind of thing: you can't change it you have to teach exactly as is like outlined. But my principal was a pretty flexible person, and I think also being a Special Education teacher I had some leeway in terms of how I taught things. So she said, “Okay, I think you have good judgment: if it's not working go ahead and change it." And I was like, "Oh no," like, I can't change it!” I was 23 years old and I was in my second year of teaching, the first year of kindergarten-specific Special Ed. I felt like, "I don't have the expertise necessary to know how to do this, I'm hoping there's someone from like the district or a couch or someone that can come in, and make the tweaks, and then I'll do it." "She told me, 'No, no, you don't understand: that resource doesn't exist. But, I think you have the capability and you're best suited to understand what your students need. So go ahead: look and figure out what's working, keep that, and what's not working, change it. I have every confidence you'll be able to figure out how to do that.'" "The lesson I learned was that, while it's really nice if you have the resources to have an expert come in and do everything—like J.K. Rowling says, "We don’t need magic to transform the world. We carry all the power we need inside ourselves already.'" It really is hard to know that. Or, rather it's really hard to enact that because it was intellectually hard to figure out what to do, but also it took a lot of time and energy and work, And there was a self-confidence piece - it was something I'd never done before. But I did in fact have everything I needed inside myself, and so, having that experience from this principal really just empowered me going forward to realize that, whatever problem I’m facing - great, if there's some expertise around something I'll certainly try to leverage it - but I can probably make some changes myself that will move things in the right direction. And that is something that has always stuck with me.